The standards MHEG-5 and HyTime are interchange formats for hypermedia information. While they may seem to compete, they actually play separate and complementary roles in a complete and open hypermedia environment. MHEG-5 is used for portable final-form hypermedia presentations. HyTime is used for the long-term, presentation-independent storage of hypermedia documents. Given these tasks, MHEG-5 can be used to encode presentations of HyTime documents. This paper explores these two standards, the cooperative roles they play and their application to the CMIF hypermedia environment architecture. The issues discussed include the semantic overlap between the hypermedia models each standard represents and how the use of each standard affects the cooperative use of the other. Rutledge, L, van Ossenbruggen, J.R, Hardman, L, & Bulterman, D.C.A. (1997). 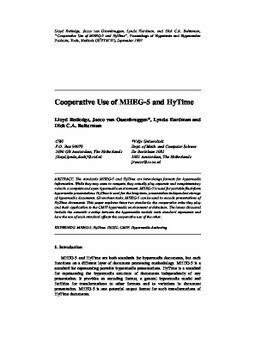 Cooperative use of MHEG and HyTime in Hypermedia Environments. In J.-P Balbe, A Lelu, M Nanard, & I Saleh (Eds. ), Actes de la 4e Conférence Internationale Hypertextes et Hypermédias - Réalisations, Outils & Méthodes 1997 (H2PTM 4) (pp. 57–73). Editions HERMES.